The hip, graffiti-themed universe of Sideway: New York was born as the result of a collaboration between “advertainment” agency Fuel Industries and W!ldbrain Entertainment, the proprietors of the eccentric children’s television show Yo Gabba Gabba! While this dynamic duo of marketing spawned the game’s world, the game itself was developed by Playbrains, whose previous console outing was a Madballs-licensed game for Xbox Live Arcade. With all these puzzle pieces aligned, it seems to paint a picture of a concerted effort to create a cross-media, kid-friendly entertainment franchise. Whether or not Sideway gains enough traction to be spun off into a Saturday morning cartoon remains to be seen, but I found the game itself to be a surprisingly fun platformer. The premise of the game is simple enough – you play as Nox, a graffiti artist who is magically transported to the world of Sideway, where he becomes a work of street art himself. An evil villain named Spray has taken his girlfriend and Nox will ultimately have to chase him down and face off against him. It’s all pretty thin, but it provides the perfect canvas for the game’s central mechanic. The environments are fully rendered in 3D, but as a some kind of magical living art piece, Nox is confined to a flat existence. Columns impede your path, the camera pivots around corners as you pass from one brick facade to the next, and your definition of up and down can change from one area to the next. This play on depth and dimensionality is complex enough to be interesting but never quite so dizzying as to become disorienting. 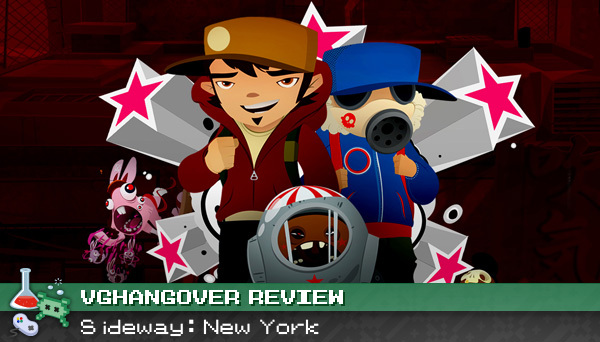 Sideway: New York does an admirable job of blending the graffiti motif with a colorful, whimsical style, sporting graphics that are charming and cartoony. 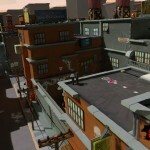 The 2D elements and the animated cutscenes are the most impressive, while the 3D rendered urban environments can feel slightly rough around the edges at times. If you’ve ever seen the animated Esurance commercials from a couple of years ago, you’ll have a general idea of what the game looks like in motion (fun fact: W!ldbrain worked on that ad campaign too). To help flesh out the urban appeal, hip-hop artist Mr. Lif was brought in to provide some appropriately-themed musical accompaniment. I was rather fond of the music – at first. I did my fair share of head-bopping, but my enjoyment rapidly turned to annoyance after hearing the same handful of tracks repeated ad nauseam. The music is great, there’s just not enough of it. Of course, this could have been alleviated by allowing custom tracks from the XMB in-game, but Sideway doesn’t support that feature. At the outset, Nox’s abilities are fairly limited in scope. He’ll be able to perform some basic attacks and traversal moves, but will steadily unlock more as the game progresses. You’ll jump, swing, and slide through about a dozen or so levels interspersed with a handful of challenging boss fights. At every turn, Sideway: New York successfully exploits the paint-based nature of the character, the environment, and your enemies. Everything from painting platforms that disappear after a few seconds to the fact that Nox is damaged by water makes perfect sense within the context of the world. Numerous details like these make it evident that much clever and creative thought was involved in the inception of the game’s design. Though the game as a whole feels thoughtfully designed, the game’s cooperative mode feels like little more than an afterthought. 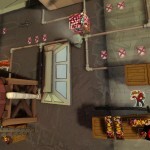 Two players can play through the same campaign levels, but the camera only follows player one, with the second player simply warping back into view if they lag behind at all. I appreciate that the co-op implementation is fully drop-in/drop-out, but playing with a second, less-skilled player can feel akin to dragging an unwilling dog around on a leash. They may be man’s best friend, but sometimes it’s easier to just go for a walk on your own. 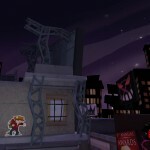 Controls are obviously an important aspect of any platforming game and Sideway is no exception. Though it might be a bit of a stretch to describe the controls as “tight”, I found them to be entirely acceptable, if not ever-so-slightly floaty. I was able to deftly maneuver through the game’s various environmental hazards with only marginal problems and only a small portion of those seemed like they could be attributed to the controls. Checkpoints are sprinkled liberally through the levels and I only recall a couple of spots where repeated deaths incited mild frustration (mostly in the last level or two). Minor annoyances aside, I had a fantastic time with this PSN-exclusive. It’s only about 4 or 5 hours long if played straight through, but there are plenty of hidden collectibles to find and high scores to beat to merit repeat attempts. Sideway: New York joins a growing stable of great games in the downloadable space that hearken back to the heyday of the platformer, each adding their own unique flavor to an established formula now decades old. Whether you’re a longtime fan of the genre or just looking for a cool game on the cheap, you can’t go wrong with this one. It’s all the fun of graffiti, without the paint fumes or risk of arrest. 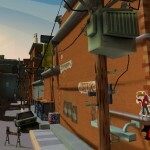 Sideway: New York was provided for review by Sony Online Entertainment. Story completed in approximately 4-5 hours. Played 3 levels in split-screen co-op. For more info on how VGH approaches game reviews, please read our reviews philosophy. Next Post Contest: win Sideway: New York!